The general public is closely divided when it comes to the use of animals in research. Some 47% favor the practice, while and a nearly equal share (50%) oppose it. Support for animal research is down somewhat since 2009, when 52% of adults favored and 43% opposed the use of animals in scientific research. Among the general public, men and women differ strongly in their views about animal research. Six-in-ten men favor the use of animal research. By contrast, 35% of women favor animal research while 62% oppose it. Strong gender differences also were found in the 2009 Pew Research survey. There are no differences among racial and ethnic groups in views about animal research. And those ages 18 to 49 hold about the same views as those ages 50 and older when it comes to using animals in scientific research. College graduates, especially those with a postgraduate degree and those who studied science in college, tend to express more support for using animals in scientific research than do those with less education. Similarly, those with more general knowledge about science are more likely than those with less knowledge to favor the use of animals in scientific research. Differences in support for animal research by education and knowledge about science were also found in the 2009 Pew Research survey. 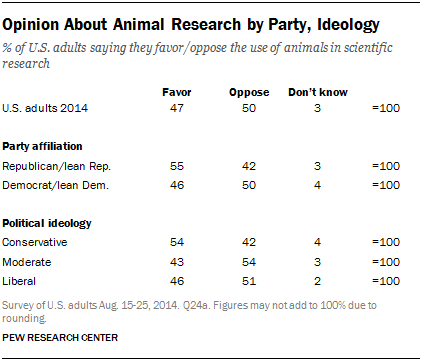 There are modest differences in views about animal research by party and ideology. Republicans and independents that lean to the Republican Party are somewhat more likely than their Democratic counterparts to favor animal research. Political conservatives are somewhat more likely than either moderates or liberals to favor the use of animals in research. A multivariate logistic regression analysis finds significant differences by education, age and gender. Those with a postgraduate degree (+0.24) as well as those with a college degree (+0.18) are more likely than those a high school degree or less schooling to favor animal research. In addition, a respondent with more science knowledge is 11 percentage points more likely to favor animal research than one with less science knowledge, after controlling for education and other factors. Looking at the combined effects of education and knowledge, those with a postgraduate degree and more science knowledge have a predicted probability of 0.74, those with a college degree and more science knowledge have a predicted probability of 0.62, while those with a high school degree or less and who have less science knowledge have a predicted probability of 0.40 of favoring the use of animals in research, holding other factors at their means. Men are 24 percentage points more likely than women to favor such research. Older adults are more likely than younger ones to favor animal research, all else being equal (+0.18). Those with no party affiliation or leaning are less supportive of animal research, on average, than Democrats and leaning Democrats (-0.18). There is no significant difference between the two major party groups, however. Political ideology is not a significant predictor of animal research attitudes once other demographic characteristics are held constant.